Author(s): Godson O. Osuji*, Plant Systems Research Unit, College of Agriculture and Human Sciences, Prairie View A&M University, P.O. Box 519; MS 2000, Prairie View, TX 77446-0519, United States	Ming Gao, Laura Carson, Peter Ampim, Aruna Weerasooriya, Paul Johnson, Eustace Duffus, Sela Woldesenbet, Jeneanne Kirven, Ebonee L. Williams, Dewisha Johnson, Diadrian Clarke. Keywords: Quinate, salicylate, shikimate dehydrogenase, stoichiometric mixes of mineral salts, time-of-flight mass spectrometry, tocopherols. Keywords:Quinate, salicylate, shikimate dehydrogenase, stoichiometric mixes of mineral salts, time-of-flight mass spectrometry, tocopherols. Abstract:Background: Medicinal phytochemicals have been used as dietary supplements in Asia and Africa for thousands of years. Biologically active antioxidants are very diverse and low in their chemical compositions thereby limiting their efficacies. 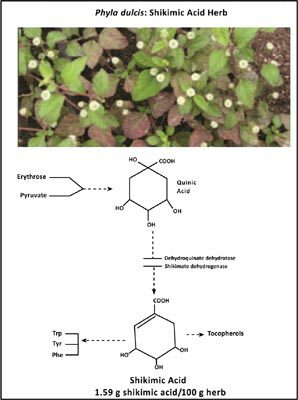 The present study focuses on the enhanced accumulation of closely related dietary antioxidants: shikimate, quinate, salicylate and tocopherol in Phyla dulcis, the Central American herb known for its anti-inflammatory medicinal properties; but its polyphenolic antioxidants had not been studied.